The Waterfront Trail can be enjoyed for a few minutes from a scenic vantage point, a few hours on a waterfront stroll, or for a few weeks on an end-to-end cycling adventure. There are 86 communities to explore on foot, by bike or by car. 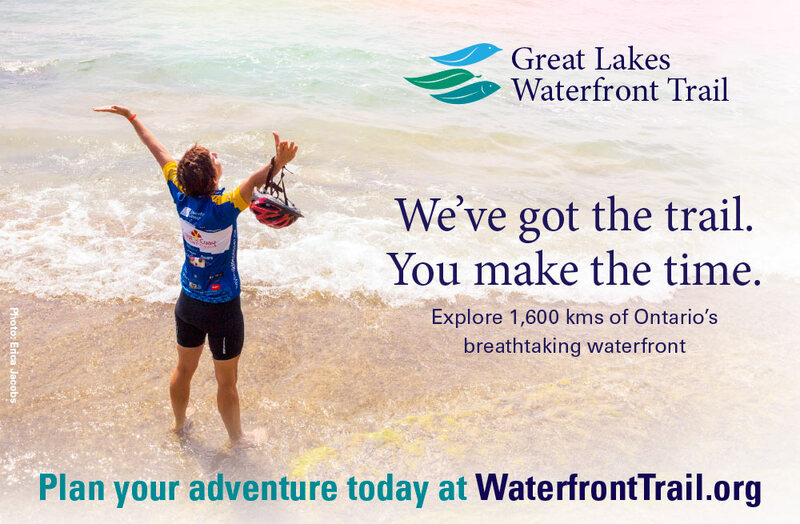 On this page, we have a range of guided and self-guided itinerary suggestions developed by the Waterfront Regeneration Trust and great partners like CAA, Ontario By Bike, Velo Quebec and Adventure Cyclists. Welcome to Waterfront Trail Adventures family friendly ideas section. We have put together a list of places connected to the trail for the best possible experience. This section is full of ideas suitable for anyone that enjoys parks, trails, and lakeside events. Over 19% of the 2,000 km Trail is off-road with another 10% using quiet neighbourhood streets and sidewalks. This canal is all that remains of the original historic Cornwall Canal, which was flooded in 1958 to make way for the St. Lawrence Seaway. A 4.4 km dedicated multi-use path now follows the south side of the old canal, allowing travelers to ride right along the water’s edge. Parking available at the western tip of Second St.
4.4km: Lamoureux Park Located right on the banks of the St. Lawrence River, this vibrant park offers plenty of sights and activities for the whole family. Tour the Eco Gardens or catch a show at the Bandshell. The park also houses a clock tower, children’s playground, the Cornwall Community Museum, an aquatic centre, and a marina. A historical plaque tells the story of the founding of Cornwall. For walkers, the park provides a 3 km return trip along the Waterfront Trail with plenty to see and do. Parking is available at the west end of the park. Washrooms at the Cornwall Civic Complex and Aquatic Centre. All summer long, the Lion’s Club Bandshell in Lamoureux Park features “Summer Arts in the Park”. Events include premier performances, puppets, and poetry, showcases of local artists and international touring companies, musicians and writers. Calendar of Events at www.cornwalltourism.com. If you’re around in July, the “Kinsmen Cornwall Lift-Off” is not to be missed. Take a ride in a hot-air balloon or check out music and events at this four-day celebration that takes place in Lamoureux Park. Find out more at www.lift-off.ca. Water St. to King St. Situated on the banks of the St. Lawrence River, Gananoque is a charming town with lots of beautiful historical architecture. Take a stroll along the river, visit historic 1000 Islands village and then head north to the old downtown. A possible side trip follows the Gananoque River. 0km: Historic 1000 Islands Village Located on Water St at the foot of Market St in Gananoque,1000 Islands Village offers a unique gift shop and some charming buildings recreated in a historical style. Parking available on Water St. Built in the style of the old hotels from the Golden Era, this building houses a number of exhibits and interactive displays designed to educate and entertain. Explore the War of 1812 and learn about local geography and wildlife. .7km: Downtown Gananoque Downtown Gananoque boasts many magnificently restored buildings and houses. Much of downtown looks as it would have 100 years ago. Head north on Stone Street to get to King Street (stop for some ice cream at Nana Splitz on Stone Street if you’re looking for a treat). End your walk by following King St. east to the Gananoque Chamber of Commerce, where you can connect to other hiking trails in the area. From King and Park Streets, a scenic hiking trail takes you north along the Gananoque River. A map of the trail can be found at the Gananoque Chamber of Commerce, 10 King St. E.
If you have the time, a boat cruise is the best way to explore the Thousand Islands. You won’t want to miss a chance to see the magnificent Boldt Castle, a 120-room century-old castle built on an island in the St. Lawrence River. 1000 Islands Playhouse If you’ve still got some energy left, why not catch a play at the celebrated 1000 Islands Playhouse. Situated on the banks of the St. Lawrence, the playhouse offers shows throughout the summer. Annual Events Every August, tourists, and vacationers flock to Gananoque for the Festival of the Islands, one of the largest celebrations in Eastern Ontario. This ten-day event offers loads of family-friendly entertainment. Find out more at www.festivaloftheislands.com. Confederation Park to Van Wagner’s Beach. (eastern side of the Hamilton Recreational Beach Trail) Approximately 2.5 km (5 km return) of restored beaches and sand dunes. Excellent casual eateries and patios along the way. Interpretative panels describe Hamilton’s rich waterfront heritage – both natural and cultural. Lift Bridge to Kinsmen Park: (western side of the Hamilton Recreational Beach Trail) Approximately 3 km (6 km return) of stunning views of Lake Ontario, restored beach lanscapes and sand dunes. Great interpretative panels with historic photos. A must-stop is Dieppe Park. Confederation Park to Spencer Smith Park – Enjoy a relaxing 11 km ride from (22 km return trip) on off-road trails passing by beautiful sand dunes and restored beaches. Great swimming (yes, in the Lake) at Beachway Park in Burlington. Stop at Scooters in Burlington for an ice cream break. 0km: Confederation Park 84 hectares of natural space and parkland. For a break from the summer heat, be sure to take in Wild Waterworks — a water theme park featuring Canada’s largest outdoor wave pool (entry fee applies): phone # 1-800-555-8775. If you prefer to swim in the Lake then check out Burlington’s Beachway Park described later. Ample parking, washrooms, and concession stands throughout the park. Camping is available at this park. 2.5km: Van Wagners Beach Baranga’s on the Beach and Hutches. Two great patios. Great fries at Hutches. 4km: Kinsmen Park Wading pool, playground, benches, and picnic tables, washrooms and parking. 6.5km: Dieppe Veteran’s Memorial Park Imagine landing on the beaches of France during WWII, under fire and having to race up the heavy stone beach in full army gear to find cover and begin your advance. This park is designed to recreate this experience and honour the nearly 200 Hamilton residents who lost their lives in this battle. 7km: Burlington Canal Lift Bridge Access from Hamilton is found under the bridge itself. On the Burlington side, use great care when crossing Eastport Drive. The bridge is fascinating to watch – a great piece of engineering ingenuity. 9km: Beachway Park and Scooters A wonderful beach with great swimming and shady, mature trees. Great ice cream at Scooters. Washrooms, showers & parking available. 10km: Spencer Smith Park, Burlington Beautiful park with lots of programmed events such as outdoor concerts. Visit Burlington Tourism or the latest events listings. Close to downtown Burlington’s shops and restaurants. Parking & washrooms available. As a special treat—take the GO to Port Credit! The station is approximately .5km north of the Trail! Visit www.gotransit.com for fares and schedules. An easy 8 km ride east from Port Credit to Marie Curtis Park (16 km return trip) on off-road trails and residential streets. Feeling energetic–do the whole Mississauga Trail (19 km one way). Walkers, Families on Wheels or Bladers – Start in St. Lawrence Park and walk west to Rhododendron Gardens for a lovely 2.5 km (5 km return). If you drive to the area instead of taking the GO train, consider a side trip to Rattray Marsh. You’re in one of the newest waterfront neighbourhoods. You’ll find lots of excellent interpretative signs and exhibits (outdoor) explaining the area’s past as home to the operations of the St. Lawrence Starch Company. 1km: Port Credit Village Marina Vibrant and attractive marina at the mouth of the Credit River. Enjoy lunch as Snug Harbour, which serves excellent family fare at moderate prices. The views of the river are lovely any time of year. Heritage buffs will enjoy the many historic photos of Mississauga’s waterfront. Washrooms, restaurants, shops, and parking available. Popular spot for shore fishing and for remote control power boats. On June 30th to July 2nd the park will be home for the popular Mississauga Waterfront Festival. Washrooms and parking available. After 12 years of negotiation, Imperial Oil, and City came to an agreement on how to incorporate the Trail on this former industrial site—once a Texaco refinery. This small park is called a window on the Lake. Entrance to the Marsh is located in the southwest corner of Jack Darling Memorial Park, which has playgrounds, splash pads, and beaches! Located at the mouth of Sheridan Creek, this is a great example of how people can make a difference. The area was slated for a housing development and marina until concerned citizens rallied to save it. No cycling is allowed in the Marsh. As a special treat- take the GO to Port Union! The station is approximately .3 km east of the pedestrian tunnel that leads to Port Union Waterfront Park. Call 416-869-3200 for fares and schedules. 0km: Port Union Village Common Your trip starts here. Arrive by Go Transit or park at the Go station. Port Union Waterfront Park is accessible by a pedestrian tunnel at the foot of Port Union Rd, about 300 m west of Rouge Hill Go Station. Parking is also available at East Point Park. Port Union Waterfront Park This wonderful new amenity is the newest addition to Toronto’s waterfront park system and showcases a brand new stretch of Waterfront Trail. Complete with cobble beaches and a major peninsula just south of the pedestrian access, this park provides scenic vistas, natural landscape and a great playground for children. Take a stroll along the beach and enjoy nearly 2 km of newly built Waterfront Trail. The newly built bridge over Highland Creek marks the western end of Port Union Waterfront Park. If you want to continue your hike from here, on the far side of the bridge you’ll find a connection to the Highland Creek Trail. This trail follows the creek north and many feel it’s among the best ravine trails in Toronto. Walkers and Families on Wheels – Port Weller – Happy Rolph Bird Sanctuary to Malcolmson Eco Park, approximately 2.5 km one way (5 km return trip). Port Dalhousie – Tour around the old port, approximately 2 km leisurely stroll. Take in shops, patios, beach, lighthouses and ride the antique carousel. Cyclists – Port to Port – Enjoy a relaxing 10 km ride from Port to Port (20 km return trip) on off-road trails and residential streets. Break at Port Dalhousie. : The sanctuary offers picnic areas, a playground, and a farm petting zoo. Take in the beautiful grounds that feature one of Canada’s finest rhododendron collections. Home to hundreds of migratory birds. Parking and washrooms, some concession stands. : If the timing’s right you may enjoy the treat of seeing one of the large ships that use the Welland Canal. To your south, you’ll see the gateway to the Greater Niagara Circle Route. Continue west on the Waterfront Trail and you’ll pass through a wonderful eco-park. 2.3 Malcolmson Eco Park (Entrance): Look around you to see a fresh new approach to creating parks. Rather than formal gardens, this park will restore the natural habitats of Carolinian forest, Savannah grassland, and wetland environment. Stonedust paths take you through its 36 acres. Look for the Waterfowl Pond, Amphibian Wetland, and the Greenhouse Compound. 3.5 Municipal Beach: Just north of Malcolmson Eco Park and on the Lake. Public washrooms and swimming available. 10 Port Dalhousie (Lakeside Park): Beautiful, vibrant, historic harbour offering many restaurants and patios, quaint shops, theatre, gardens and boat tours. By the lake, you’ll discover a wonderful beach where you can swim, restored 19th-century lighthouses, picnic pavilions, and an antique carousel, which you can ride for just 5 cents! Take in the area’s rich heritage on one of many historic walking tours available. Cyclists – Start at Lynde Shores Conservation Area at the western edge of Whitby and cycle to Second Marsh for a brisk but beautiful 19 km (38 km return trek). Catch a break at Lakeview Park in Oshawa before visiting the Marsh. If that seems too daunting, start at Thickson Woods to reduce the mileage to approximately 20 km return. 0 km: Lynde Shores Conservation Area: Visit this stunning natural area with access to two provincially significant wetlands. Great as a destination itself. Be sure to bring bird seed as the chickadees will land on outstretched hands to feed. Wonderful new clubhouse located on a natural harbour. Washrooms, restaurant, lounge, and parking. 5.6km: Rowe House Museum Tribute to the tenacity of local heritage enthusiasts. Enjoy various historical and other exhibits in this beautifully restored home that belonged to the first mayor of Whitby Captain James Rowe. Long pier stretching out into Lake Ontario and beautiful pergola. 7.1km: Heydenshore Kiwanis Park Great playground for kids under the shade of mature trees. Lovely beach. This is the last remnant of old-growth white pines on the north shore of Lake Ontario. Its forest paths are enchanting and you can easily spend 30 minutes hiking among its treasures. This is a real favourite with kids. Just north of the Woods is a meadow. Both the forest and meadow were purchased and cared for by dedicated volunteers striving to protect this natural asset. 12.6km: Lakefront West Park New addition to Oshawa’s waterfront park system. Vibrant waterfront park with excellent beach and 3 museums with interesting stories to share. Playgrounds and concession stands. 19.4km: Second Marsh Largest remaining urban wetland in the GTA, Second Marsh is another testament to people stepping up to protect our natural heritage. The Marsh has a network of trails, boardwalks, and lookouts with excellent interpretation panels to help explain the significance of the marsh. The Waterfront Trail takes you through the Marsh along its edge, which is stunning, but you should leave some time to explore the paths. The Marsh hosts many educational events and walking tours. Visit http://secondmarsh.outdoorontario.ca/ for more information. The Great Lakes Waterfront Trail is the beginning of many wonderful regional loops created by our community partners. While cycling is the chief trail use, there are some wonderful hiking experiences as well. Lennox Addington County (Greater Napanee, Loyalist) — about 2 hours from Toronto and Ottawa and 3 hours from Montreal. Durham Cycle Tours—a pdf map showing 14 fantastic cycling loops that include the Great Lakes Waterfront Trail (off-road from Pickering to Oshawa!) and the Greenbelt Route. It describes over 700 km of cycling! Download GPS and PDF versions of the map at https://www.durhamtourism.ca/cycletours. Greater Niagara Circle Route-140km loop that follows Lake Ontario, the Niagara River, Lake Erie and the Welland Canal system. Check out Niagara Cycle and Stay–a group of B and Bs who will move your gear ahead to the next stop. About 90 minutes west of Toronto. Several routes taking you along Lake Erie and the Grand River.